The fashion industry is constantly changing -- for proof, just check the back of your closet for those once beloved pleated jeans, shorteralls and the blazer with quarterback-worthy shoulder pads. In fashion, it’s not just the styles that are evolving -- the way we shop has fundamentally shifted, too. Today, we can browse and buy without ever leaving our living room and still get our items delivered in time for a last-minute business lunch. Or we can sit back and leave the decisions in the hands of professional stylists we’ve never actually met. No matter the approach to finding fashion, we pretty much all agree we want shopping to be easy, convenient and, in many cases, customized. Let’s take a look at what’s hip for today’s mass consumer fashion industry and what the takeaway could be for the small business owner (SBO). Sites like Stitch Fix, Fabletics, Adore Me, Rent the Runway and Trunk Club all offer apparel through membership or subscription via mail. Provide your measurements, style preferences and budget, and a stylist selects pieces on your behalf. A box then ships straight to your door. With some services you keep only what you want, while others include a free gift (like new pair of leggings). Have you ever ordered the same pair of jeans in three sizes -- your usual size, plus one bigger and one smaller? The box arrives, you try everything on, keep one item and then pack up and return the rejects to the company. Then you wait days for your refund to hit. The whole routine is kind of a drag, right? Stitch Fix and company exist to simplify and speed up this process. Today’s busy consumers appreciate having one less thing to do and think about, and these businesses have automated the entire selection, shipping and return process so you don’t have to deal with it. How can SBOs make their products or services quickly and easily available to customers without obliterating their bottom line or sacrificing quality or customer service? Create a subscription-based model (think wine clubs, the local gym and magazines) or, at the very least, offer a loyalty plan (maybe a punch card for a freebie) or special services (free delivery, perhaps) for repeat customers. With so many places and ways to shop, offering a small but carefully curated selection of items can be inherently appealing. Whether you’re selling custom T-shirts, hand-dyed scarves or ethically sourced hats, sometimes it makes sense to find your niche market and zero in. Once upon a time hiring a stylist was a practice reserved for the wealthy or famous, but not any more. Even if your clothing business doesn’t fall into the luxury category, you can still give your customers the VIP treatment with a small thank you note, a surprise gift, or a phone call to check in on customer satisfaction. Bespoke clothing companies have been cropping up like very expensive, fashionable daisies lately. These companies are taking the “simplify options” idea one step further by providing laboriously tailored original garments for a specific client. Schaeffer Garment Hotel in Los Angeles isn’t a hotel at all, but they do offer custom jeans for close to the price of a hotel room for their rugged, hipster clients. Why sell ten pairs of $25 mass-produced jeans that everyone else has when you could sell one pair for $300 and make your customer feel super special? At online clothing retailer eShakti, the fashions aren’t from scratch, but they are customizable. Select a basic dress and make it sleeveless, choose a longer hem or pick out a different fabric for a close-to-bespoke garment. The options seem limitless (in truth, they are finite! ), and the customer feels one-of-a-kind. With so many mass-produced fashions these days, owning something unique, high quality and tailored just for you can feel like a rarified experience. But it’s one that consumers are willing to pay for when they know they’re investing in a long-lasting perfect fit. Provide personalized service, one-to-one care and a bespoke product or service that your business alone can offer. Many customers are happy to pay a premium for a premium experience. It’s nice to have choices, but SBOs shouldn’t feel they have to be everything to everyone. Rather, be strategic about your offerings. Selling hand-stitched leather bags? Showcase six designs -- not 60! No matter how much you love the convenience of online shopping, you can’t try on clothes through your screen. But we still want immediate gratification (or close to it) from our online purchases. Even when we shop in person, we expect to see a huge selection of trendy choices available in every size. Mega-retailers like Forever 21, Target and Old Navy are quenching consumers thirst for immediacy -- they don’t call it “fast fashion” for nothing. Thanks to Amazon Prime, it seems almost insulting when shipping is anything other than fast and free. And giant retailers have the “runway to store” formula down pat. How can SBOs compete? Realistically, they can’t -- but maybe that’s a good thing. Maybe you can’t deliver your product to your customer’s front door for free in one day, but you can text or email friendly shipping updates, use high-quality packaging and include a handwritten note. Customer service is still a major differentiator when it comes to building long-term, loyalty-based relationships. When was the last time Mr. Bezos penned a personal note thanking you for your business? The human touch goes a long way with customers, and it’s even more important today in light of the frenzied, Internet-dominated ever-changing retail and clothing industry. As Paul Simon said, “Slow down, you move too fast/ You got to make the morning last.” Remember, providing high-quality, custom products and services along with some good old fashioned customer service will never go out of style. 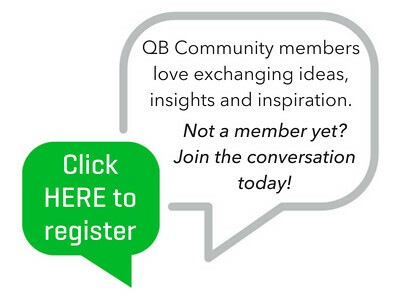 QB Community members, have you experienced any small business shift in operations in these modern times? Has your business made changes or been affected by consumer demands for immediate availability? Automating the shipping and return process - yes, please! Making it easier for customers to return items makes it easier for the seller to manage inventory - everybody wins. I've worked in the training industry for the past 10+ years. In the old days, it would be a lot of effort to book a class and then all the students who show up at a scheduled time. The trend now, in the modern business economy, is for a student to pay for the training which he can usually get in a short time. In just a few hours, a prospective student can search online for a tutor and have an on-demand training session over a webcam/screenshare platform. It is crazy how fast you can connect with a tutor who is a subject matter expert.